Fabio Leimer won the Bahrain GP2 feature race after judging his pace perfectly from pole position. Having taken pole by a second, Leimer just had to fend off an early charge from Stefano Coletti and then manage the gap at the front to take his second win of the season from his early title rival. 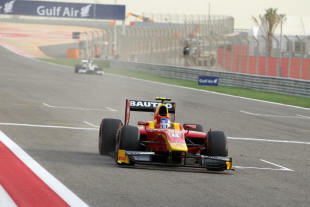 Alexander Rossi was an impressive third on his GP2 main series debut for Caterham, holding off Felipe Nasr on the line. Leimer's job was made all the easier when second-placed man Marcus Ericsson failed to get away at the start of the formation lap and had to start from the pit lane. A brilliant start from Sam Bird saw him jump up to third from ninth, while Leimer had to defend from Coletti early on. Jolyon Palmer passed Rossi for fifth up the inside in to turn one at the start of the second lap, and for the opening six laps the field started to spread out before the first round of pit stops to take on hard tyres. Rossi re-passed Palmer in the pit stops, while very slow stops for Bird and Nasr dropped them behind Rossi, Palmer and Stephane Richelmi. When the leading two drivers pit, Leimer retained his advantage but Coletti had to fend off Rossi for second. Nasr passed Bird in to turn one soon after their stops, with both then dispatching the earlier-stopping Richelmi, but traffic was in the mix as drivers who started on the hard tyre ran longer. With 12 laps to go GP2 debutant Robin Frijns tried a move up the inside of Richelmi in to turn one but ran in to the side of the DAMS car and damaged his front wing while Richelmi was forced to retire. Quaife-Hobbs led for a long spell on the hard tyres and then passed Tom Dillmann after the pair made their stops for soft tyres. Nasr held off Bird and then put on a late charge to pass team-mate Palmer and close down Rossi, eventually finishing 0.4s behind the Caterham. Bird came home sixth while Quaife-Hobbs and Dillmann - having both enjoyed a long battle with Simon Trummer - came home seventh and eighth to make up the front row on the reverse grid for tomorrow's sprint race.